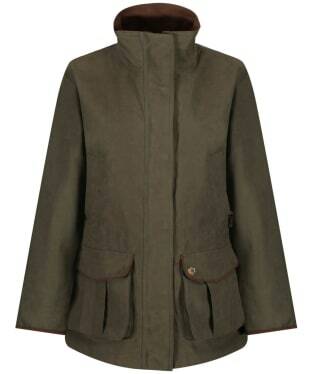 The Women's Alan Paine Berwick Waterproof Shooting Jacket is the perfect companion for days spent in the country this season and beyond. This jacket offers you a waterproof and breathable outer which means you can head out no matter what the weather maybe bringing! 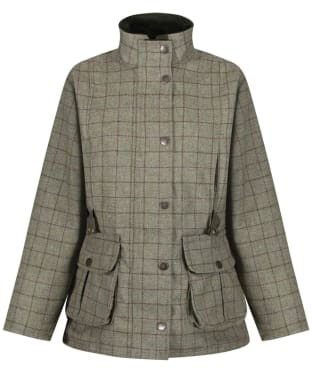 The Alan Paine shooting fit offers you added room which is perfect for any additional layers on those colder days or to give you added freedom of movement when you are out on those country pursuits. The soft mock suede inside collar is perfect for offering you added comfort and warmth; the waterproof windbreaker cuffs are also another welcome addition which are perfect for when those colder days arrive. The adjustable drawcord waist will help to create a flattering fit, as well as added ease of movement, definitely needed on those shooting outings! For added convenience this jacket features an array of pockets including two flap-secured cartridge pockets with side entry hand warmer pockets, map pocket and a zip secured internal pocket which is perfect for keeping any valuables safe and secure whilst on the move. The Alan Paine Berwick Waterproof Jacket is the ideal companion wherever you may be heading this season! 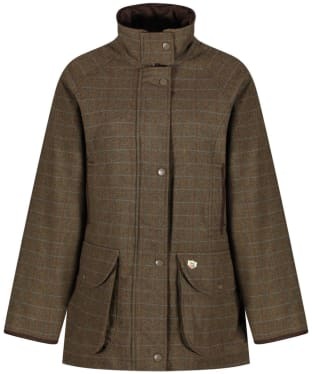 The women's Alan Paine Rutland Field Coat offers you a stylish yet practical coat, ideal for completing your country look. This waterproof and breathable coat will carry you through country life with ease, giving you added protection from the ever changing weather. 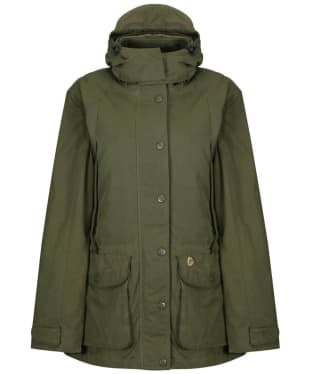 This practical coat boasts an array of pockets giving you added convenience, such as two cartridge pockets, handwarmer pockets and a secure internal pocket meaning plenty of room for all your essentials. For added style and wearability the coat has been shaped for a feminine fit, as well as contrasting mole skin collar for added comfort. 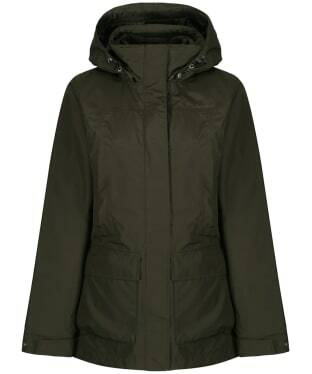 This coat is ideal for keeping you out enjoying the countryside no matter what the weather brings. 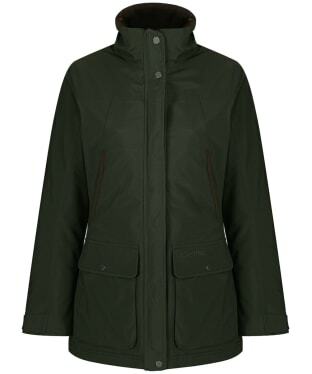 The women's Alan Paine Dunswell Waterproof Coat is a gorgeous waterproof and breathable ladies jacket which features a detachable and adjustable peak hood, windbreaker cuffs and Alcantara trim on the inside of the collar for enhanced comfort and wet weather protection. The draw cord adjustable waist allows the fit of this stunning ladies coat to be tailored to your individual shape, while the back vents and shaped sleeves help to ensure excellent movement at the same time. 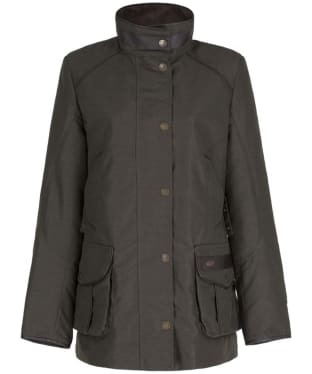 The Dunswell Waterproof Coat from Alan Paine features two cartridge pockets with eyelet drainage holes, two hand warmer pockets and two internal secure pockets with secure map pocket under the front placket. 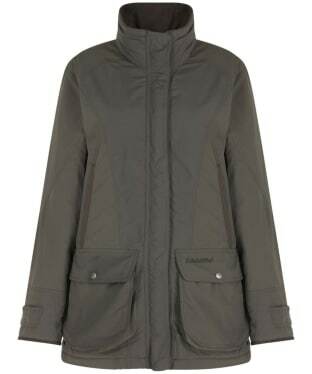 This beautiful waterproof and breathable women's jacket from Alan Paine is a super stylish way to stay dry this season. 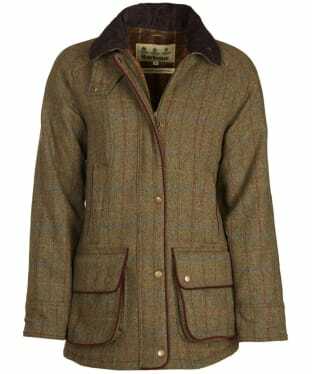 The Women's Schoffel Rockingham Coat is a high performance sports coat which does not compromise on style. Cut to a more contemporary fit, the Rockingham coat features a Venturi® two-layer laminate which is exclusive to Schoffel. This laminate system combines all weather protection, meaning it is wind and waterproof while still remaining breathable and soft to wear. To ensure this coat will keep you warm and comfortable in the cold weather, the Schoffel Rockingham Sports Coat is padded with Primaloft Insulation which is a fantastic alternative to down and will ensure you are warm even below 0°c. For when the storms come, you can take advantage of the detachable hood, while a storm placket covers the two way zip to keep rain at bay. The Rockingham Coat features a series of pockets which all have unique features. To the outside, you will find two micro-fleece lined hand warming pockets which come complete with storm flaps, while inside there are two zipped security pockets where you can save your essentials from any rain or spray. 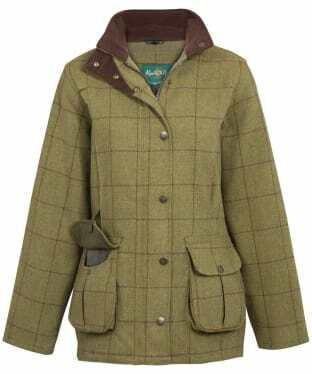 For the active sportswoman, two large cartridge pockets feature to the lower outer of the jacket. The flap closures can be clipped back thanks to the retainer straps, allowing for easy access to your cartridges. A removable recoil pad features to the inside of the jacket, and can be inserted to either the left or right shoulder for both handed shooters. This jacket is finished with alcantara trims and Schoffel branded embroidery. The Women's Schoffel Superlight Ghillie Coat is an insulated Venturi® shooting coat using innovative super lightweight Meryl® outer fabric, which is also strong, durable and abrasion resistance. 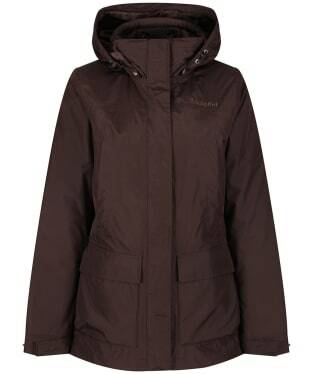 The Venturi® Z-liner also makes this coat 100% waterproof, windproof and highly breathable. Sporty yet stylish, it's cut to a feminine fit for a more flattering look. It's quick drying and features include chin guard, storm cuffs, cotton canvas collar and trim and detachable storm hood. Multiple pockets make this the ideal jacket to wear all day long - micro fleece hand warming pockets, bellow cartridge pockets with drainage holes and retainer strap for easy cartridge access and two inside zip security pockets.